There are a lot of lakes around the world, close as the lake Vico, in Tuscia near Rome, and far away, like the Lake Hillier, a pink lake in Australia. There are lakes that do not seem lakes, lakes where you go to swim with jellyfish, and lakes that are called Chargoggagoggmanchauggagoggchaubunagungamaugg. 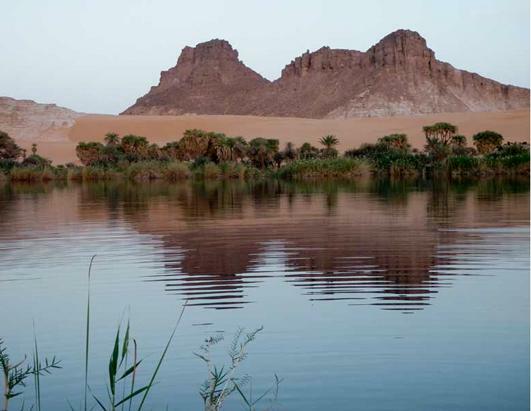 Then there are the lakes that are located where it should be, as a series of lakes that are located in the Sahara desert, in the north-east of Chad, occupying a basin among the Tibesti Mountains, and that for this reason, the 2012, appear in the list of protected sites as a UNESCO World Heritage Site. These are the Ounianga Lakes. Already it was only a lake that would be something exceptional, but here’s there are about 18 lakes that are located in a desert as hot as to be defined and hyperarid, with rainfall less than 2 mm per year. If this is not a record! The total area of the lakes is about 20 square kilometers, just over the beautiful Lake Orta. The largest of these lakes is called Lake Yoa, approximately 3.5 square kilometers wide, which reaches 20 meters deep. Small when considered in absolute terms, great if you think about where it is. Group names are derived from the name of the lake from a nearby village (literally, Ounianga Kebir = “the great Ounianga” and Ounianga Serir = “little Ounianga”).